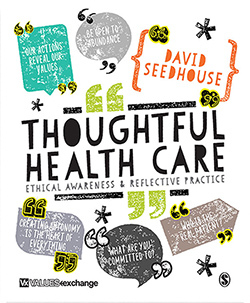 Adult nursing senior lecturer Karen Sanders reviews Thoughtful Health Care: Ethical Awareness and Reflective Practice. This easy-to-read book is a must for nurses seeking to improve the care they provide. It challenges many of the belief structures in the NHS, as well as how healthcare professionals see the health service. It also examines clearly and honestly where policymakers have made mistakes. Fictional scenarios, stories and ‘stop and think’ statements are presented throughout the text to challenge the reader’s views, encourage them to think independently, develop their problem-solving abilities, improve their critical decision-making skills and reflect on their own practice. The eight chapters explore subjects such as values, the use of simplistic labels, how healthcare professionals view patients and the purpose of the NHS. The book’s format helps readers to review critically and reflect on these issues. At the end of each chapter, for example, there is a useful summary of the issues raised. The final chapter provides a practical and useful toolkit that nurses can use to develop and provide appropriate, high-quality treatment and care. Readers are also encouraged to join the book’s online community to share their opinions and access extra activities and support.